The tremendous loss of life resulting from the December 26, 2004 tsunami emphasized the necessity of establishing and improving tsunami warning systems in countries of the Indian Ocean. While the Pacific Tsunami Warning Center (PTWC) in Hawaii notified officials in some countries about the probability of a tsunami generated by the Sumatra Earthquake, there were no protocols for distributing this warning information to appropriate government officials, media, community organizations, and coastal populations. 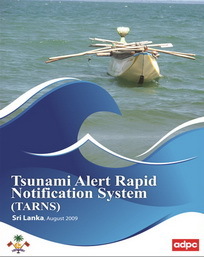 The Tsunami Alert Rapid Notification System (TARNS) is a set of common protocols and procedures used to ensure that tsunami advisories or warnings are sent from a national focal point to all relevant national and local officials so that the public receives the information quickly and accurately. All the National Disaster Warning Center has the lead responsibility to enhance and refine national alert rapid notification system in their country. TARNS include a quick-response system not only for tsunami alerts but it can be expanded to include alerts for other disasters as well. A set of common procedures and protocols developed for all relevant entities, and coordinated based on the government structure, culture, infrastructure, and available technologies. Initially TARNS has been developed in the National Disaster Warning Center (NDWC) of Thailand to enhance the national early warning system in Thailand. This paper describes the development of TARNS system in Thailand.